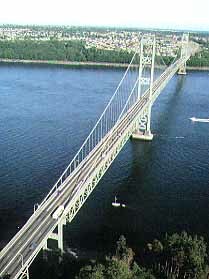 The Tacoma Narrows Bridge is one of the largest suspension bridges in the world. The center span is 188 feet high and 2,800 feet long. The present bridge replaced "Galloping Gertie," an architectural failure nicknamed for the way it swayed in the wind. The ill-fated span collapsed 4 months and 7 days after it opened in 1940.